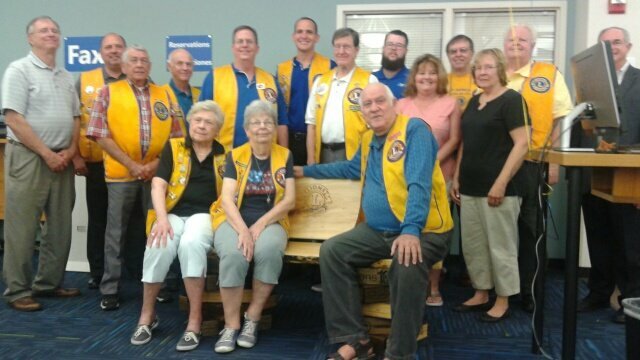 The Duncanville Noon Lions Club recently unveiled a custom designed wood bench at a reception held June 7 at the Duncanville Library. The reception was attended by a number of Duncanville Lions Club members, and was part of Lions Clubs International’s Centennial Celebration of their 100th anniversary. 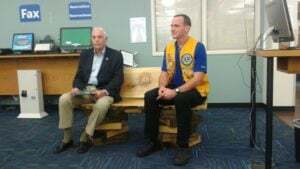 Noon Lions Club President, Kasey Cheshier, and Mayor David Green made remarks and welcomed members of the community to the unveiling. Kyle Ballard of Ballard Custom Builds, who designed the wooden bench using pine wood with books as the legs, was also present at the event. The book spines highlight key service areas of Lions International such as Environment, Disaster and Hunger Relief, Literacy, Texas Lions Camps and Vision. Duncanville Lions Club member John Thompson, who will serve as Grand Marshall of Duncanville’s Independence Day parade July 4th, also attended the reception. Librarians and other Duncanville Library staff members were also invited to be among the first to sit on the new bench. 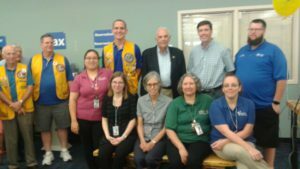 Duncanville Noon Lions meets each Friday from 11:45 a.m. to 1 p.m. at the Lions Club Community Building, 210 Lions Trail. For more information on the club and its projects, please visit www.duncanvillelions.com or contact Lion Kasey Cheshier at (682) 556-0240.